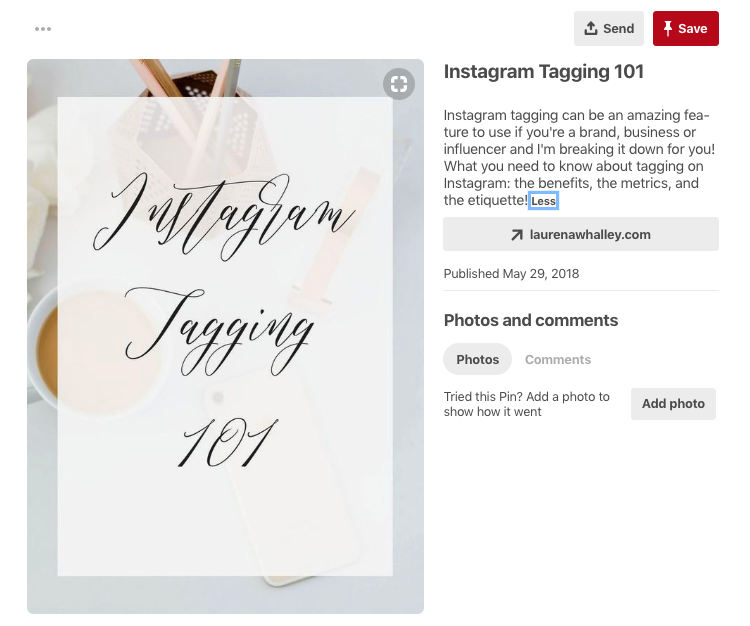 One of the wonderful, often-misunderstood things about Pinterest, is that you can and should strategically Pin your content more than once, and in different ways. Done right, you save time by repurposing existing content, and you’ll get your content in front of more people who are likely to engage with it. You see, unlike traditional search engines, where “duplicate content” can be a problem, each time content is shared to Pinterest, Pinterest gains more context about the Pin and has more information on where and to whom to show the content. Much of that context comes from the boards to which a Pin is saved. Pins are shown first to our followers, who cannot be expected to catch every single Pin we save. After all, your Pin is just one of over 100 BILLION Pins saved each month. Granted, you won’t see ALL of those in your smartfeed or your follower tab, but even if you follow just 1,000 Pinners, all of whom share the average quantity of 10 Pins per day, you could have up to 10,000 Pins in your follower tab daily. No one can see ALL of them! So, resharing your Pin gives it another opportunity to be seen and to generate engagement for more distribution. Then consider the fact that Pinterest recently reiterated the need for businesses to Pin consistently – daily if they want to succeed on Pinterest, and it becomes clear that for those of us who don’t publish new content each day, we will need to reshare! It’s a great way to be active with less effort. Which Pins Should I Reshare? Concentrate on resharing engaging Pins that convert for your Pinterest traffic. Does one product or a category of product just fly off the shelves when Pinners visit? Pins leading to that page would be a great place to start. Are there 10-20 blog posts that keep growing your email list with Pinterest-referred traffic? Give them the exposure they deserve by resharing Pins to that content. Want to support a friend or business partner on an ongoing basis? Reshare their best content. As long as your followers find it engaging, resharing can help increase its distribution on Pinterest! Do people say nice things about you in their blog posts? Lucky you! A nice way to say thanks and to increase exposure for that content for your own benefit is to share it at the best times for engagement. Finding it tough to be a consistent, active Pinner? Knowing how important that is, sometimes you do need to share other people’s relevant content – and it might as well be engaging to your followers. Why? Well, if you followers engage with it, it will be distributed more widely. People who see that Pin may follow you. Those people are already engaging with content like yours, so when your own content appears in their feed, their engagement can boost your content, too! To identify specific Pins worth resharing, use Tailwind’s Pin inspector. Sort by Repins to find the Pins that work well. Take notice of the date it was Pinned. If there is an element of seasonality to your Pin, try resharing it at about the same time of year. The board a Pin is saved to also makes a difference! Try sharing it to the same board after some time has passed. From here, you can schedule it to go out again. Just because a Pin hasn’t done well yet doesn’t mean it won’t! You could save the same exact Pin again to see if timing or seasonality makes the difference this time. If it doesn’t, no worry. Since each Pin stands on its own merit, you have nothing to lose if it doesn’t take off. The reach of your next Pin will not be affected. That’s not to say you should be wasting your time sharing Pins that never return results. Instead, try creating a new image, with a new keyword-rich description and some relevant hashtags and save that instead. Mindlessly looping Pins in a “set-it-and-forget-it” strategy will NOT help your content be found on Pinterest. 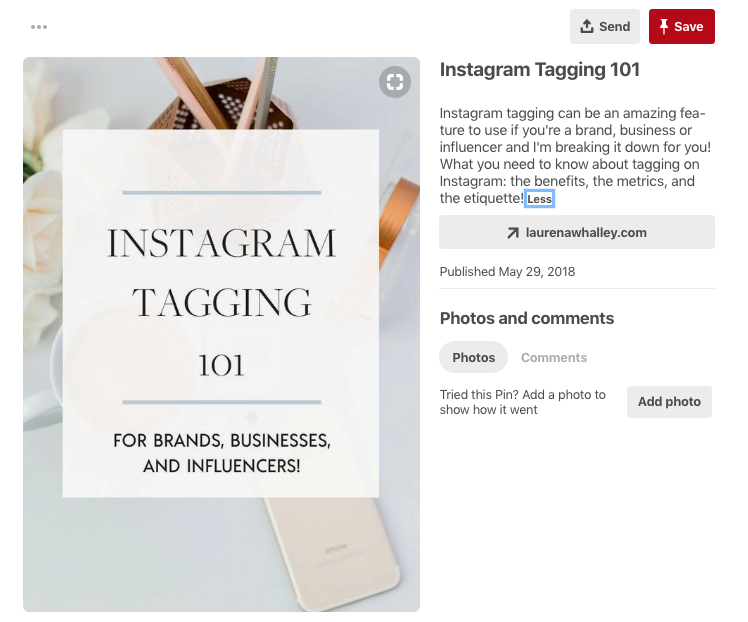 Similarly, actual Repins of your own content by you are not helpful (Pinterest knows it is your content and will not see it as engagement on the Pin). Pinterest wants content creators to share fresh instances of their own Pins and leave the repinning to followers. Stick with Intentional resharing which incorporates best practices, helps you Pin consistently, and which is constantly infused with new, fresh content. Pinterest recently revealed that our Pins are shown to our followers first, and then, based on their engagement, the algorithm will determine how much to show it in other places on Pinterest. So, while most of the activity on Pinterest happens in search, the most important engagement you can get is from your followers. Which means it is vital that you get your Pins in front of your followers. Even the most active Pinterest user can’t catch everything in their Follower Tab and SmartFeed. Knowing that then, especially if you notice that a Pin is particularly engaging, maximize your opportunity for follower engagement by giving them more than one chance to see your amazing content! The Follower Tab (and the Smartfeed as well) have so much great content, it’s easy to miss something! Real Life Example: Your follower, Sandra, is active on Pinterest, but like all of us, her interest in various topics ebbs and flows. Lately, she’s been engaging heavily with other people’s Pins about gardening, so hasn’t noticed your recent Pins about DIY Cleaning Hacks. In a month, when her garden is producing more zucchini than she knows what to do with (or on another day when she’s in a different mood), she may save or click on the DIY cleaning hacks Pin that you shared again. If you’d only shared it once, or even to all your boards in the period of a month and then never again, she might never have noticed it. She might never have engaged with it – which would mean she never got to send Pinterest a signal that this is content worth spreading. Pro Tip: When you use Tailwind’s SmartSchedule, you can be sure your Pins are going out when your followers are most likely to engage, but you still want to give them more than one opportunity to do so. If your Pin fits on ten of your boards, save it to ten of your boards. Because your Pin will carry with it some data from the boards it is saved to, save it to the most relevant board first and then over time make sure it gets on every board that makes sense. Each time you save to a new relevant board, you’re giving Pinterest more context to explain the Pin, which helps Pinterest show the Pin to people who are likely to engage. And yes! You can share the same Pin to the same board again, but we’ll get into that shortly. One thing you should not do is Pin to irrelevant boards. Why confuse Pinterest with mixed signals? Your “cauliflower pizza recipe” does not belong on your “brownies” board – adding it there dilutes the helpful context your save should provide. Real Life Example: Your Pin for your 3rd Grade Math Problems printout should go to your “3rd Grade Math” board, your “Elementary Math,” board, your “3rd Grade Teaching Tips” board, etc. But, it doesn’t belong on your “Phys Ed Ideas” board. Pro Tip: Have you set the category for all of your boards? This matters in the quest for context and distribution. “Don’t forget to pick a board category to help Pinterest better understand your content.” says Pinterest. Take a few moments and edit your boards, making sure you’ve selected the most relevant category for your content. Tool Tip: When you have a new blog post or product listing, Pin it to the most relevant board right away, and then use Tailwind Board Lists and Interval Pin Scheduling to get your new content on Pinterest at sensible intervals. Without this time saver, you could either forget to save to all relevant boards or risk filling up the follower tab with too many repeat Pins, decreasing follower engagement and sacrificing the exposure of your other content. Which takes longer – writing a fantastic blog post or creating a new Pinnable image? For most of us, the answer is clear – create a new image! Think of each additional image you create as a chance to give your content double (or more) the exposure on Pinterest. “It’s okay to have multiple Pins that land on the same destination. In fact, it’s good to save a variety of images that appeal to different types of Pinners.” – Pinterest. Real Life Example: Lauren Whalley, a social media strategist and publicist, commonly creates more than one image for each blog post. Her strategy follows Pinterest’s recommendations exactly – she’s created two Pins which will appeal to different types of Pinners! Each of the Pins is designed to appeal to a slightly different Pinner. No doubt Lauren is watching engagement rates on each version of her Pin so she can adapt her strategy over time. Meanwhile, because she’s appealing to a broader audience by customizing her images and text, she’s likely getting much more traffic with two Pins than she would with one! Pro Tip: Notice that both images fit her branding and her site design so that when a Pinner clicks, there’s continuity of style from Pin to post, which makes for a great user experience. Experiment with text, style, and colors, but don’t stray too far from your site design and branding. Tool Tip: Add each image for the same content to your Tailwind Tribes, but not all at once. Your Tribemates may not mind sharing the same article twice when there is another image option and when some time has passed. Also, remember to use Tailwind Board Lists and Interval Pin Scheduling to share all your images for each piece of content on Pinterest over time. Take advantage of a Pinterest SEO boost when you change the description of your Pins as you reshare. Think of this as your opportunity to test out different sets of keywords on each one and to increase the number of searches which may pick up one or the other version of your Pin. “Just make sure to add specific descriptions for each Pin—it’ll improve your SEO.” – Pinterest. See how our first alternative focuses on “carefree,” “simple,” “no stress” and “fun”? The second might show up in many different searches. Same article, different angle. Pro Tip: Try different descriptions, but be honest about what they’ll get when they click, while still appealing to people searching slightly different topics and keywords. Oh, and don’t bother editing old Pin descriptions. Pin a fresh version of your content instead. Tool Tip: Look at your Tailwind Pin Inspector to see which version of your description generates the most engagement. Notice trends and apply what you learn to the writing of future descriptions. Hashtags in Pin descriptions are useful especially in helping brand new content surface in hashtag search results, but Pinterest also states that, “(Using hashtags) will help us categorize your content so it can be recommended in places like search and home feed.” So, as with using different sets of keywords, resharing content with different hashtags is another way we give Pinterest context and increase the opportunity for search result exposure! According to Pinterest, “People use hashtags to discover trending, relevant content.” So, the hashtags you use in a Pin description in July might not be the same as the ones you use in January! Real Life Example: A Pin such as “10 DIY Headboards” (pictured below) works great for the #backtoschool hashtag which should start trending in July, but could easily be reshared with #diyheadboards, #bedroomideas, etc. at the height of crafting season. Pro Tip: Check out Pinterest’s Trending topics and see if any hashtags shown there fit on your Pins. Follow the “Pinsights” section of Pinterest’s blog for monthly and season trend reports. Tool Tip: Grab Pinterest’s free Possibilities Planner – start planning your content creation and resharing according to forecasted trends. Pinterest suggests that we “… start saving Pins that are relevant to upcoming trends, seasons and holidays about 45 days before the event.” This applies to new AND existing content as long as the information is still current. Remember to apply the hashtag tips we shared above to appeal to people looking for your content right now. Real Life Example: That blog post you wrote last year about Summer Vacation Planning with Kids should be shared again starting in about March of this year, too. As long as the content is still relevant, Pin it again when people will be looking for it. Pro Tip: Take a tip from above and freshen up your images for your post. Try editing the post title and Pin image to add the current year to it so people know it’s up to date. How Many Times Per Day Should I Pin? There is no magic number. Pinterest just wants you to be consistently active. That might mean five Pins a day, or it might mean 50. There is no maximum. But spread them out so that you’re not Pinning 50 times all at once and then sharing nothing for a week. See our interview with Pinterest’s Head of Product Marketing, Sarah Hoople Shere, if you’d like to get the answer from the source! How Far Apart Should I Schedule Reshares of the Same Content? That might depend on how much content you have. For example, if you have two thousand blog posts to share, you have so much variety that you could share ten per day consistently until you get through all of them and then start again without looking spammy or causing your followers to unfollow. If, though, you only have 10-20 blog posts or product listings, you’ll want to spread those out amongst content from other sources, perhaps sharing only one or two Pins of your own per day to avoid being overly repetitive or appearing spammy to your followers. Your content deserves to be Pinned more than once. Make the most of your hard work by resharing your Pins easily and intelligently with these techniques.